Vespa is the most famous and beloved scooter in Italy thanks to its unique style and signature shape. And judging by the constant growth of its sales, Vespa seems to have also conquered the hearts of many customers around the world: in the last 9 years the purchases have more than trebled, from about 50,000 to approximately 121,000 units sold worldwide. The new Vespa 946 is inspired by the first prototype designed by Corradino D'Ascanio, the MP6, which becomes the “father” of the most popular and recognisable scooter in the world. The first Vespa was born in the spring immediately after the end of the Second World War, and still remains an unequalled example of Italian design and creativity. The Pontedera Style Centre has reinterpreted the scooter in a modern key to appeal to a new generation of customers, merging tradition and innovation together. The engineers have worked with quality materials and have used aluminium extensively to reduce its weight and to increase fuel efficiency and manouvrability. At the heart of Vespa 946 is a new engine, which promises to reduce consumptions and CO2 emissions: Piaggio declares that the scooter can cover more than 55 km with just 1 litre of fuel and pollutes 30 percent less than standard models. The scooter is equipped with a single cylinder 4 stroke air cooled engine with 3 valves, 2 intakes and 1 exhaust, with electronic fuel injection. 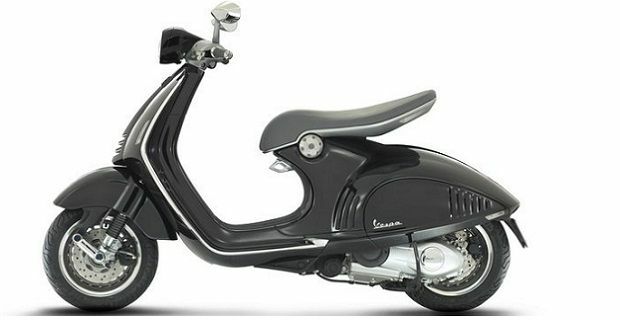 Piaggio Group has used the latest, state of the art technology to design and produce Vespa 946. The first production version of the scooter will be displayed at EICMA (International Motorcycle Exhibition) in Milan, Italy.